Envelopes generally don't get a lot of love—especially the ones holding big fatty bills that need payin'. Small consolation, but the privacy patterns that line the insides can actually be pretty awesome. 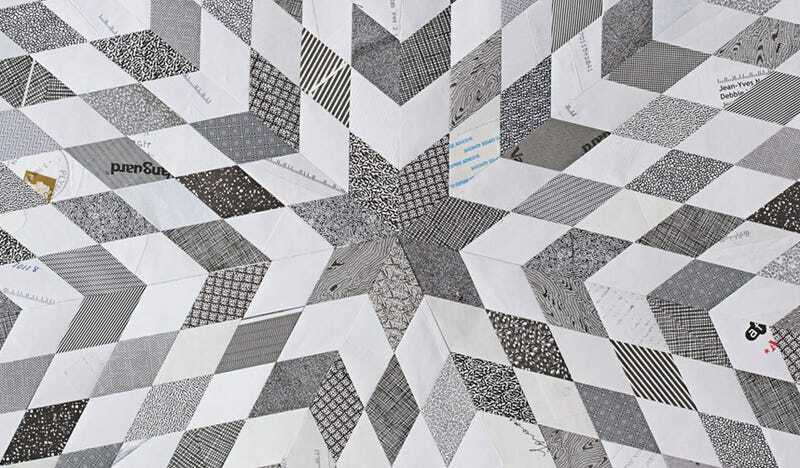 Artist Stephen Sollins gives these paper relics a gallery-worthy second life as massive, incredibly intricate quilts—and they're great. From far away, you'd think these were just traditional textiles sewn together, and it's only when you get a view up close can you make out the markings of their former use: a bit of an address, the corner of a logo, the recycling symbol, or "PAY CHEX" repeated over and over again. It's a nice tie to the traditional quilting, which is precise but personal, a combo of careful plans and the inherent human touch of the handmade. "Mailing envelopes exist at the unavoidable intersection of communication and privacy," Sollins writes on his site. "Their contents are banal yet guarded: private thoughts mingle with business records and utility bills." The fact that these scraps were all destined for the garbage at one point makes the project particularly sweet, and hats off to him for the patience it must have taken to get all the edges just right and the geometry just so.